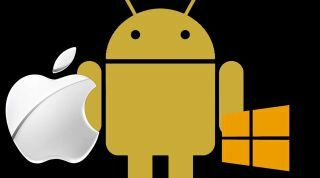 Windows Phone has finally eased past BlackBerry and Symbian to take third place in the smartphone race, but IDC's latest figures make it clear just how much of a two-horse race between Android and iOS it has become. Apart from IDC's analyst brilliantly suggesting that this amounts to "more than the lion's share" of the smartphone market, the breakdown of market share is just as deserving of attention. Apple's iOS accounts for 17.3 per cent of the market (down from 23 per cent in the same quarter of 2012) and Windows Phone has captured 3.2 per cent for third place, leapfrogging ailing BlackBerry which has declined from 6.4 per cent to a meagre 2.9 per cent. That means Windows Phone is growing faster than Apple's iPhone - although it has a long journey before it is competing for silver. At the foot of the table Linux and Symbian both fell away - the latter declining from a relatively healthy 6.8 per cent of market share in Q1 2012 to a terminal looking 0.6 per cent. Microsoft and key partner Nokia will certainly be buoyed by the 7 million Windows Phone handsets shipped - compared to just 3 million this time last year, and Apple - despite losing market share - has still managed to flog 37.4 million iPhones compared to 35.1 million in 2012. But Android - and that means principally Samsung - is the real success story, taking advantage of a burgeoning market to sell more than 70 million more handsets than a year ago.